Roberto Ferrari is known as a sprinter that can both fight against the strongest lead-out trains and that doesn't hesistate to support his teammates. 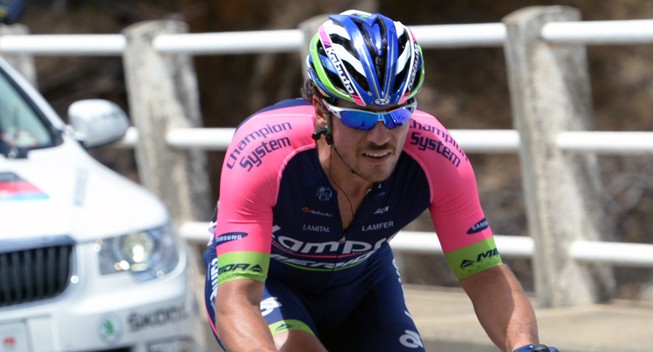 Now he has extended his contract and will ride with Lampre-Merida in 2015 too. The blue-fuchsia-green team has renewed the deal with the 31 years old Italian cyclist, confirming another rider who contributed to the very good season for Lampre-Merida despite the fact that he didn't obtain any victories. "I'm very happy to have the opportunity to race for the third season in the team," Ferrari said. "It's an outstanding group, whose riders, sponsors and staff members are on the top level. The intention by the team to rely on my skills and extend my contract makes me very proud, because it confirms that it knows the value of my skills and of my efforts. "I know I haven not yet won wearing blue-fuchsia-green colors, this will be a motivation to try to do even better to obtain personal results but also to my support to my teammates. After eight years in the pro cycling, my experience is very high and I would like to exploit it to help my teammates and the other sprinters of the team." "Roberto is a generous rider and his skills make him a precious cyclists since he can exploit the support of his team mates, can fight against the opponents' lead-out trains and can be an effective help for his teammates in their quest to achieve their goals. His presence on the 2015 roster will give an extra value to our group of sprinters." For Ferrari, 2015 will be the third season with the team. He has won 11 races in his career, most notably the Giro d'Italia stage to Montecatini Terme in 2012.